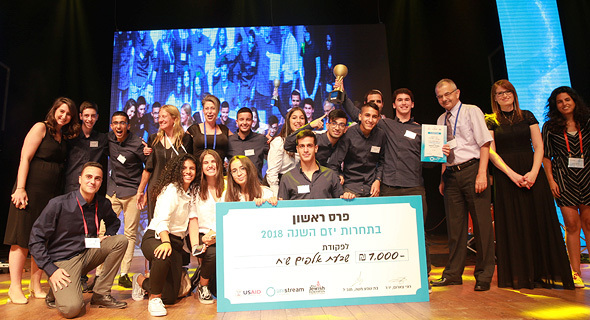 A team that developed strips for individualized allergen detection in food won first place at the annual entrepreneurship competition held by Unistream, an Israel-based organization aiming to impart underprivileged teens with entrepreneurship and leadership skills through a multi-year program. Winners were announced at an event in Tel Aviv last week. The third-year winning team comes from Acres, a coastal town in the north of Israel. The team developed portable strips that rapidly identify allergens in food based on individual sensitivities, winning 10,000 NIS and a trip to an overseas conference. In the second-year category, a first place NIS 7,000 prize went to a group that developed a smart bot that supplies users with gifting recommendations. The competition also awarded an “impact” prize to a group that developed a clothing line for children with disabilities or special needs. Unistream was founded in 2001 by Rony Zarom, an Israeli serial entrepreneur who previously founded Exalink Ltd., acquired by Comverse Technology Inc. in 2000 for around $480 million. Zarom, who came from an underprivileged background himself, founded the organization to bridge the widening socio-economic gaps in Israel. The organization is active in 60 communities across Israel, focusing on diversity and reaching over 4,000 teens and young adults across a wide span of Israeli society. The organization operates 13 entrepreneurship centers that help teens to set up their own companies and receive mentoring from professionals and entrepreneurs. Zarom and Unistream CEO Batsheva Moshe spoke at the competition, highlighting its inclusive nature in the face of the current political environment in Israel. “The organization was founded based on the principles of equality, and it embraces every person,” Zarom said.